The RHA T10i headphones offer amazing sound quality, tuneable audio and stunning build quality. The more I review headphones, the more I realise that I've come to rely on more than one pair. Mood, you see, is as important to me as anything when I'm listening to music. Sometimes I want the audiophile experience. To hear what was recorded, and nothing more, with no hint of colour from the headphones. Sometimes, though, I want to have my noggin rocked by insane bass. The RHA T10i's claim to offer both, thanks to the use of tuning filters. As well as having tuning filters, the T10i's, which cost £149.95 (US$199.95, about AU$283), are made from injection moulded metal, with over-ear hooks, a set up that RHA claim offers effective noise isolation. They also come with interchangeable ear buds. It's fairly easy to make a pair of headphones that are good at one thing or another. It's obviously impossible to make a pair that can offer audiophile performance, while also giving amazing bass. But there is a narrow line where headphones can have just enough bass to serve as funtime cans, and still have the definition and clarity I sometimes lust after. 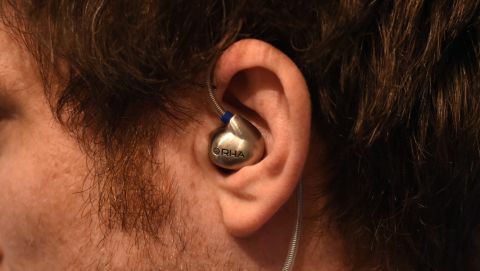 The RHA T10i in-ear headphones don't quite offer that, for reasons I'll explore in this review, but they do give me a pair of headphones that meet almost every desire I have when it comes to audio. The first thing that gives the RHAs an advantage over many headphones is their interchangeable tuning filters. These are tiny little attachments that are placed on the tip of the earphone, and adjust the sound very slightly as it passes through. The upshot of this is that you can get head melting bass or go for a more pure sound. The problem here is that even the "reference" tips have a lot of bass. Much less than the bass tips, but not enough to give them any right to claim that they are leaving the music untouched. Though this won't matter to most people. To fit these filters you simply unscrew them from the end of the earphone and replace with another. RHA warns you not to remove the tips without replacing them, as this could allow dirt in and damage the drivers. The other nice idea for tips is that it could be possible to sell different ones down the road, and give a new sound. The first thing I noticed about the T10i headphones was their metal construction. This gives them a weight that's enormously pleasing, but also presents the potential for problems with them being more likely to fall out. I didn't have a problem with this, but I did have to try literally every set of ear tips to get to a set that fit. This is my first really negative comment about the RHA T10is: none of the tips are really quite big enough for my fairly average ears. Neither of the foam pairs fit, which is a shame as these are my preferred tips for comfort and noise isolation. The double flange tips were the most comfortable and best sized. Perhaps because of the metal body, and high weight, the T10s are provided with ear hooks. These, plus the way the earphones themselves are made from injection moulded metal make them look like the kind of earphones you see on musicians. That's with good reason because all of this ends up making them very comfortable. Usually, with tight-fitting earphones, you get a lot of cable noise when you're walking but this is somewhat reduced on the RHAs because of the over-ear hook. They make for ideal companions for a nice walk around town. Because of the in-ear fit (when you get them to fit) and the size and design of the earphones the noise isolation is excellent. Far better than most earphones I've used. That gives them a good head-start when it comes to sound quality. The sound quality is amazing but sometimes the bass can get a little bit much. For the most part, with pop music, it's fine. If you're into electronic music then you might find the bass a little wearing at times. Switch out the filters for the treble-enhancing ones if that's the case.